While DU fans are rightfully proud of Magness Arena, the reality is that some of DU's facilities haven fallen behind peers. Many of the locker rooms at Ritchie Center were redone with insurance monies as a result of flooding over the summer. Others, such as men's lacrosse, were expanded to accommodate the basic needs of a growing program that weren't being met with the older facilities. In the NCHC, the Ralph Engelstad Arena in Grand Forks, North Dakota is NHL-quality all around. From the locker rooms to the stadium itself, "The Ralph" is second to none in NCAA hockey. Omaha just built a new multi-sport stadium in Baxter Arena which opened this season, Miami (OH) recently spent 3.5 million dollars on a hockey locker room upgrade. St. Cloud recently spent 30 million on facilities, including a new locker room. UMD just moved into a new rink two years ago with new facilities. CC & Western Michigan, NCHC basement-dwellers, have the oldest and least appealing facilities. 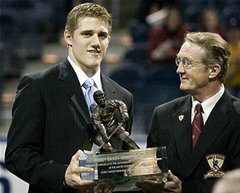 While, we're not advocating the construction of a brand new arena, Magness is now 16 years old, which is extremely old in the modern athletics era. The hockey locker room has endured years of wear and tear without major modifications or upgrades in those 16 years. Overall, the footprint and locker room foundation is good but it needs to be expanded. Many recruits and current players see the locker room as a face of a hockey program. Recruits also look for practical benefits of a modern facility - shower facilities, space, dressing areas, lighting, branding and meeting space. Players spend a great deal of time in this area getting ready for games and practices and unwinding after games and practices. This team space is important to both current players and potential recruits. In a recent letter, Coach Montgomery appealed to alumni and season ticket holders, citing a critical need to upgrade the locker room to maintain DU's position as a national hockey power. Internally, there has been ongoing conversation about funding a remodeled locker room facility even since the George Gwozdecky era. The fundraising target for the project is $2.0 million dollars and DU is hoping to break ground in the spring. While this project will require significant funding, a premier program must have premier facilities to compete. Historically, DU has avoided undertaking capital improvements without cash-in-hand so this is going to require participation and wide giving, of both large and small amounts, over a short period of time to get this done. LetsGoDU strongly endorses this project and will keep readers up-to-date on progress and provide more details as they become available. Editor's Note: As a smaller school by Division I standards, DU has been fairly insulated in recent years from the proliferation of these top-tier athletics facilities. That is simply not the case anymore. 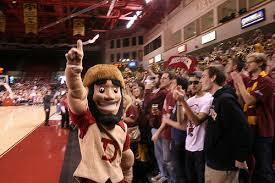 DU must keep up with the Division I "arms race" to continue as a national power in more than just lacrosse and skiing. The University of Colorado-Boulder, a school that is much more seriously affected by the arms race, resisted joining this movement as long as they possibly could. They suffered as a result as their football program has not been relevant in over a decade. It is becoming increasingly clear that the length of irrelevance is a direct result of poor facilities. Finally, this year, the Buffaloes finished their $142 million "Champions Center" and the future seems to be looking better for that program. 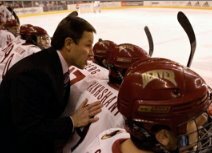 The University of Denver has no intention of letting something like that happen to the hockey program. DU Hockey is to college hockey as Duke basketball is to college basketball. A good DU hockey program is good for the sport. With more advanced facilities in Magness Arena, DU will have the tools to compete at a high level for the foreseeable future. We encourage all members of the DU community to strongly consider donating to this project. It will benefit all stakeholders involved with the athletics program. That's a guarantee. Comparing DU hockey to Duke basketball is a joke nice 4 game skid. Both are private schools that have won multiple national championships - Duke 5 and DU 7. In that regard, they are the most successful private universities in their respective sports. Denver has gone to 14 frozen fours and Duke 12 Final Fours. If you can find a more successful private university in hockey, be my guest. DU does not have access to public funds for capital improvements and relies on the goodwill of alumni and friends of the university. Comparing major college basketball to college hockey doesn't work either. Duke basketball or athletics just has to ask for donations and it gets them. No so for DU. Just sayin'. True allright. 2 bills for Duke basketball is nothing for them and a more challenging task for DU. Coach K could make one phone call and be done. DU will need lots of contributors. Between Stastny, Bozak, Colborne, Bennett and Zucker should be good a million between them. 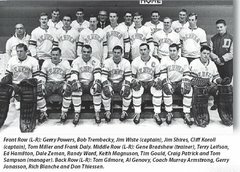 The rest of the hockey alums should be good for another half million, and the fans should be good for the rest of it. Anonymous, " fans should be good for the rest of it." Are you thinking fans are good for $500,000. Seriously? What fans, that aren't alumni, are going to give that kind of money to refurbish a locker room? The fans care about the arena and the product on the ice, not locker rooms. 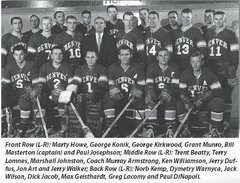 There are a number serious boosters of the hockey program who never went to DU, but love the program. 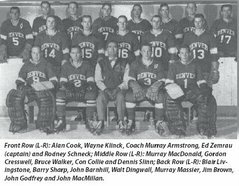 A number of them have had sons play minor hockey in the DU program, while others are hockey fan season ticket holders for generations. I'm sure DU will come up with the money, and yes, you'd think that some of the successful hockey alums could contribute some of it. However, reading that Miami spent 3.5 million to upgrade a fricking locker room, and that DU needs 2 million to upgrade a fricking locker room, kinda makes you sick. Agree with anonymous. What does $2 million get you in a locker room? Absurd amount. I am in the construction business. First, 15 years is about the useful life for any commercial bathroom/locker room. Second, not sure of the square footage but it does have to accommodate 30 players, coaches, and trainers - the space has to be huge. If you look at plumbing, electrical, HVAC, fixtures, carpeting, lighting, lockers, etc. plus training rooms, whirlpools, etc. it is going to cost a great deal of money. Big mistake to compare this to your home remodel. Sounds like the $'s are in the ballpark (pardon the pun) to me. It is important that DU fans step up and help our program remain competitive by donating what you can afford to this effort. Yes, in an ideal world, locker rooms would not matter. But today, these places are far more than places to change clothes. Student-athletes spend many hours per day in these complexes - studying, eating, taking injury treatments/rehabbing, etc. It is the nerve center of the program, and to an 17-18-19 year old recruit, these places do matter a lot in the decision to come to a school. For these kids, the locker room complex IS the tangible shorthand expression of a school's commit to winning in hockey. North Dakota has its own chefs for the hockey team, for example. Other than the initial post on this blog, who says DU hockey needs a new locker room? Just because other colleges have refurbished or built new ones that means DU does also? If any of you have been in the locker room recently please share specifics of what you saw. Is the AD conducting tours now? Has Coach Montgomery said his team needs a new one? If your next-door-neighbor buys a Cadillac Escalade do you then go out and buy one? Trust me, DU needs a new one. As the article said, Magness is more than 15 years old now, and due to the odd footprint of the Rithcie Center which had to fit a lot of different facilities into a odd-shaped space, the dressing room facilities were designed to be basic and efficient, rather than than the all-day student centers these facilities need to be. DU has been low-key about the locker-room renovation so far, with all the communications to date targeted to all of the hockey alumni and major DU donors. The hope is the lion's share of the money raised will come from them first, since the renovation is not something the public will ever see. If there is a public side to the fundraising, it will come later, if at all. That said, as avid DU hockey fans, helping out the hockey program is important. If you wish to be a part of it, contact Ryan Peck, Ryan Lowe or Beth Kuwata at the athletic dept. 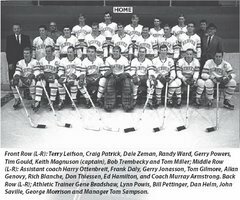 To answer the question about whether members of the DU hockey program have actually come forward and said that DU needs a new locker room. the answer is yes, Coach Monty has, in fact, said that the program needs a locker room renovation. I believe the letter he sent out to select members of the DU community was referenced in Tim's article, above. DU recruits against all of the other top programs in the country: UND, MN, BC, BU, MI, among others. The facilities are a crucial piece to the puzzle. DU has a state of the art weight room and training facilities with a theater style video room that all of the sports get to utilize. It is only a few years old. Magness at 15 years old has already received its first upgrade with new lights, scoreboards, ice making machinery, etc. The hockey locker room is still one of the few areas in the arena that has not been upgraded. DU has made it clear that they are not funding a locker room renovation. This is Monty's first big fund raiser and he is first looking internally to hockey alums and hockey friends to make it happen. To be successful year in and year out you need a combination of four-year players and elite recruits who stay less than four years. The elite recruits are the hardest to get as they have their pick of where they want to go. To land an elite recruit you need state of the art facilities especially the locker room where the players send much of their time at DU. The 2004 and 2005 DU Natty Championships reflect teams that were recruited to play in a relatively new facility. One of the reasons elite players like Paul Stastny and Matt Carle chose DU were the state of the art facilities at the time. While facilities are not the only reason for an elite player to decide on a school they are a very important6 factor. Hopefully, by next fall, the locker room renovation is complete and ready for the 2016/17 season. Swami provided the names of the people to contact for anyone interested in funding this venture. I know those people have marketing material already available for this project. I don't think anybody is doubting that locker rooms are important, or that it's important to keep up appearances when other schools are doing so. But I will repeat--3.5 million dollars spent on a locker room is a horrendous and ridiculous amount, and so is 2 million dollars. No wonder DU will not foot the bill for this. Of course I hope that Montgomery can raise the money for this. But when you compare a fundraising effort to raise 2 million dollars for a locker room to a fundraising effort to pay valuable professors more money to keep them at DU, the locker room sounds like folly. There is only a certain amount of money out there for donations. The people that are being asked for 2 million dollars for the locker room, are also people that might spend 2 million dollars for something more worthwhile. Again, I hope the hockey team gets what it needs, but it would not be surprising to me if this is a difficult sell. 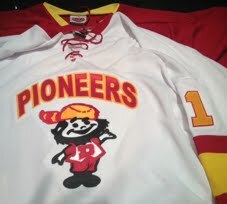 How is it folly to ask hockey alums or friends of the hockey program to donate to this project? Lot's of these people care deeply about the hockey program.It's an "arms race" and I don't won't to see DU Hockey not being able to compete facilities wise with other top notch hockey programs. DU can raise tuition again if they want to pay professors more. "DU can raise tuition again if they want to pay professors more." That's a pretty ignorant statement. With that logic only money rasisd by the athletic department should go to athletics, including scholarships. Are all the players on the hockey team on full scholarships? Doubtful. Raising tuition means hockey players and other athletes will have to also pay more to attend DU. Gloves are dangling........Sarcasm doesn't translate well here.